You exchange all of the usual pleasantries, ask after the other half and the kids, and then the question turns to occupation. "So what are you doing for a living now? Are you working or are you just blogging?" I sit for a while taking the words in...wondering if I'm right to feel offended by them. Obviously this person didn't MEAN to offend me, they were just asking a simple question...they probably never thought anything of it...After all, so few people understand what blogging is or what it actually involves. To many people blogging is seen as a hobby...and to many people that's exactly what it is...and so I guess it's understandable that the fact that this is my occupation confuses people. But still, it's that word "Just" that really gets to me. I find it presents itself ahead of my job title most of the time, no matter who I find myself in conversation with. Maybe it's just me being easily offended...it probably is, I often am!....but I feel the need to defend my career of choice against this word "just"...because while it may not be the most widely understood of jobs, it may not be the most noble or skilled or demanding...it IS a job all the same. It has it's highs and lows like any other job. It has it's "Bad days at the office" just like any other job. It has it's moments where it gives me nothing but stress, where I feel like throwing the towel in and looking for another job and never doing this ever again. It has its moments where, no matter how well I think I've planned my timetable, it takes me away from time with my family and leaves me feeling bitter and resentful. It has it moments when it's all too challenging and I feel that I truly don't have any more to contribute, that I've reached the end of my rope with it and I have nothing left to say. But just like any job, you take the rough with the smooth....and there are many, MANY upsides to it that mean that overall I love what I do and wouldn't change it. So...you might question then why I would care what other people think about it? If I'm happy in my work, does it matter? Well...on the whole, no it doesn't...but I think in any occupation, no matter how much you love it, if you're continually asked if you're "Just" doing that for a living...with that flippant use of the word "Just" implying that there's not much to it or that it's not a real job...it's pretty demoralising. Would you ask someone if they're "Just" a binman? "Just" a supermarket assistant? "Just" a hairdresser? "Just" a doctor? "Just" a lawyer? My working week is approximately 48 hours on average. I am responsible for meeting all of my own deadlines, which means that the basic daily duties of my job include (but are not limited to): Writer, editor, photographer, advertising commissioner, web designer, Director of social media, Schedule organiser, accountant, and being my own PA (Responding to emails & phonecalls, scheduling meetings/events etc). I am single handedly responsible for my own earning potential and success based on how well I maintain my readership figures (By coming up with new ideas constantly and writing to the best of my ability) and domain authority (by keeping a constant check on the quality of my links), and how efficient I am at responding to potential clients. I don't have the luxury of leaving my work behind me when I come home at night and close the door, working from home means that work never leaves...there's always more I can do...there's always a niggling post-it memo glaring at me from the computer reminding of something that needs to be done...switching off is VERY hard. I can make or break my own success with a misjudged social media statement or blog post, the responsibility of my "brand reputation" and - in turn - my livelihood lays only on my shoulders. I started this "Business" single handedly...it was built entirely by me, and it was me who turned it into a profitable job for myself...I am not only self employed but I created this entire opportunity for myself. And it took a lot of time, effort and hard work. It's not the hardest job in the world...but that doesn't mean it's always easy. It's not the most skilled job in the world...but that doesn't mean it doesn't require skill. It's not the most life changing job in the world...but that doesn't mean it hasn't been helpful to some people. 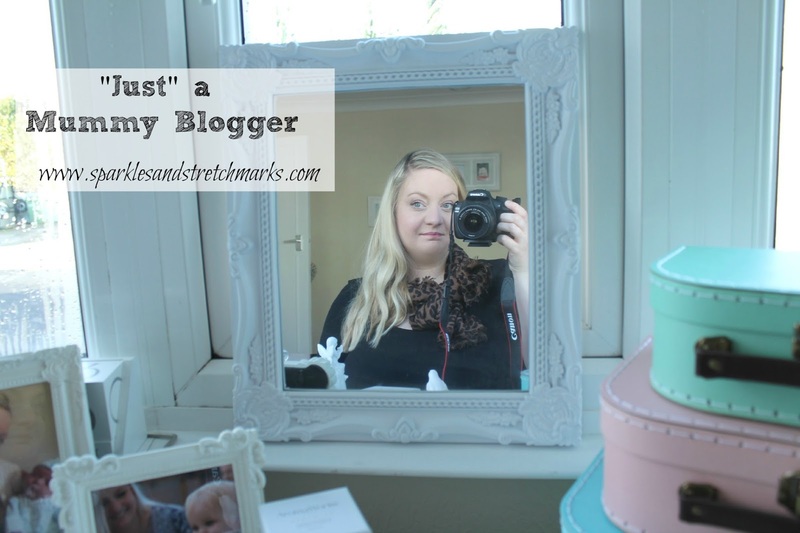 So yes I am a mummy blogger...but not "Just". Love this blog post, I do only blog for hobby/fun but I fully understand those that have it as a very full time job! I would love to give up my day job and blog full time but I am very early days maybe one day! For now I guess I'm "just" playing at blogging !!! It's interesting isn't it? Initially when I started blogging it was very sporadic - just when I felt like I needed to offload. But then more and more I began to post more regularly and include other things that I liked; perhaps the odd home or fashion piece - and the social media aspect get began to get busier too, as a result. I remember my husband saying that I should concentrate on my design jobs, rather than 'just' buggering about on Twitter and I remember saying 'I'm not *just* buggering about - I'm working!'! I reminded him of this conversation just last week, funnily enough, as since then we've had lovely things happen as a result of my blog. Days out, holidays, lovely things for the home, for the boys — even a couple of cars to review — plus I'm beginning to make a living from my blog too. Yes! And the "oh did you get that free" also riles me. I'm nearly approaching my blogs 2nd anniversary, I'm nowhere near as successful as you or many of my favourite bloggers but even just the amount of work I've done already is hard work and tough. I've been a SAHM while blogging, then went back to work now I'm back at home again. At the moment I'm not gaining anything financially from blogging but maybe that will come. It isn't "just" blogging though it's every other job title we have to do the role of too. My hubby also thinks that I just "piss about" online. I think the problem is just. I use it myself. When I worked, I worked just part time. Just 2 days a week. I hate to say it but if you asked 100 people, just would be used much more for women than for men. I'm never just a mummy though and I can live with that. The fact that you are working full time through your maternity with three children under three makes the statement "just" a mummy blogger laughable! Successful blogger, full time Wonder Woman! Yeah I can see how that would rile you up! I blog alongside a pretty full on career - but I still refer to blogging as my part time job as it really can include so many 'real work' elements you can't just dismiss it as 'just blogging'. And it has brought us lots of fun opportunities and things for our home. Money too! I think many self-employed people face the same prejudices about their job being just something they potter about doing - I don't think it is limited to blogging. It is very annoying though and definitely not right!